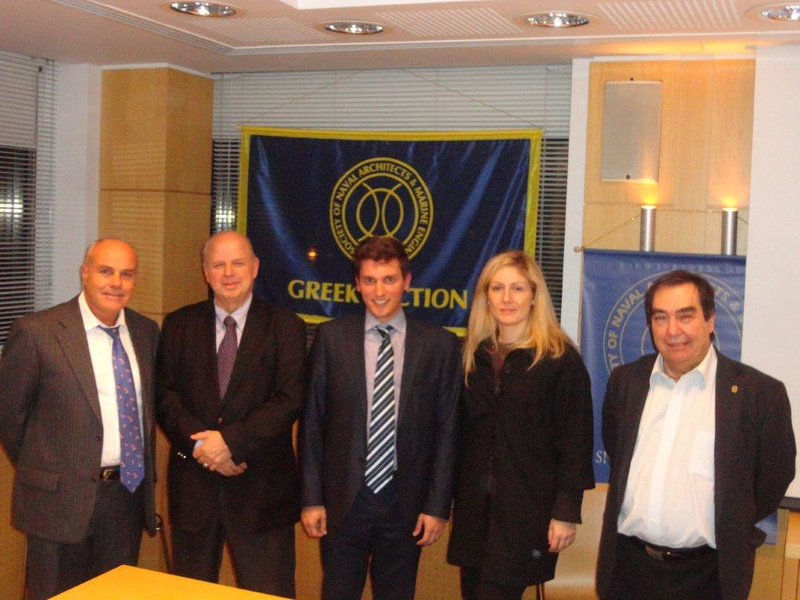 Technical Meeting Report on: Dr. Eleftherios Dedes, Superintendent Engineer at Polembros Shipping Ltd., Greece , speech on the subject of: "Hybrid Power Systems for Diesel Powered Ships'', presented on 11 December, 2014. Our last technical meeting of 2014 took place in the hospitable Auditorium of Angelicoussis Group of Companies. Our meeting was attended by 38 members and 8 non-members. These numbers can be characterized as a great success because the weather was stormy with torrential rain conditions. The brave souls in attendance were compensated by a great presentation by Dr. Eleftherios Dedes, Superintendent Engineer of Polembros Shipping, who spoke about “Hybrid Power Systems for Diesel-Powered Ships”. Global shipping makes a significant contribution to CO2, SOx and NOx emissions. The target set by the speaker was to provide an alternative reliable, economically feasible, marine propulsion system to reduce the CO2, SOx, NOx and particle emissions for ships. A hybrid propulsion system is proposed that uses multiple diesel–electric generators and battery storage. The analysis indicates that hybrid propulsion may give an attractive rate of return as well as significant reduction of emissions. Implementation will require review of class society regulations and generation of new ones as needed. The combination of a prime mover and an energy storage device/battery for reduction of fuel consumption has successfully been used before in automotive industry. The shipping industry has utilized this for submarines with conventional propulsion. The potential of a load leveling strategy through the use of a hybrid battery–diesel–electric propulsion system is investigated. The goal is to reduce exhaust gas emissions by reducing fuel oil consumption through consideration of a re-engineered ship propulsion system. This work is based on operational data for a shipping fleet containing all types of bulk carriers. Noon reports from a fleet of bulk carriers were studied to identify the amount of time that the engine is operating off-design. Furthermore, the energy requirements of the fleet were understood for laden and ballast loading conditions. The engine loading and the energy requirements were calculated, and sizing of suitable propulsion and the battery storage system were proposed. The changes in overall emissions were estimated and the potential for fuel savings identified. The efficiency of the system depends on the storage medium type, the availability of energy and the displacement characteristics of the examined vessels. These results for the global fleet indicate that savings depend on storage system, vessel condition and vessel type. They could be up to 0.32 million tons in NOx, 0.07 million tons in SOx and 4.1 million tons in CO2. These represent a maximum 14% of reduction in dry bulk sector and 1.8% of world's fleet emissions. The economic feasibility depends on the capacity and power of storage medium. Towards identification of the proper and most efficient type of system to store energy for marine applications Sodium Nickel Chloride and Vanadium Redox Flow batteries were investigated as potential energy storage devices. Criteria were low weight, high energy density and low cost. The electro-mechanical efficiency of batteries reaches up to 92% in low current conditions and can be up to 88% on the average. Sodium Nickel Chloride Battery was found to be the more economically feasible option. Vanadium redox Flow batteries have also high potential representing a promising technology. Fuel savings can exceed 1m $ per year. The cost of initial investment is relatively high. Consequently a ROI (Return of Investment) study might provide significant information on the economic feasibility of the hybrid system on a given vessel. Following the presentation of this innovative technology a lively and informative question and answer session took place. All agreed and stretched the need for holistic approach by the regulatory bodies to avoid conflicting requirements as it happens today. The meeting closed with the traditional get-together reception on a festive mood due to the imminent holiday season. This Technical Meeting was attended by eight non-member and thirty eight SNAME members.